Silvio will be carving chocolate again at Melba’s, Woodside, from 10am – 4.00pm on GOOD FRIDAY. 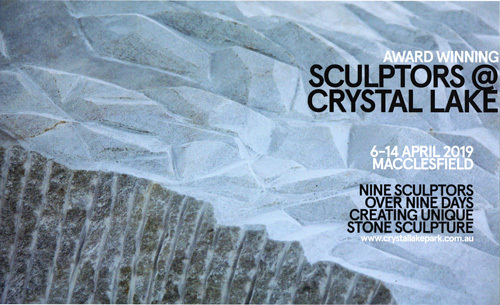 Silvio will again be artistic director of the Sculptors @ Crystal Lake stone symposium to be held at Macclesfield from the 6th to the 14th April, working alongside Quentin Gore, Jina Lee, Barry Lincoln, John Nelson, Tim Spooner, Peter Syndicas and Sally Wickes with Robert Wuldi assisting. On Saturday 13th he will be carving chocolate supplied by Melba’s, Woodside. 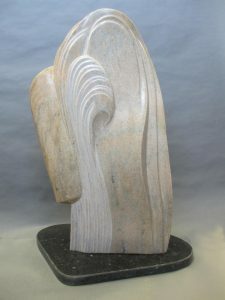 Silvio will be exhibiting his marble piece “Goolwa Beach”. 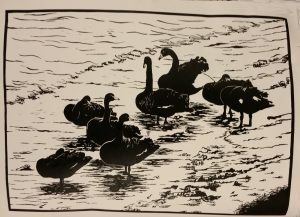 Silvio has a selection of new lino-cut prints on show at The Olive Branch Café, Balhannah Shopping Centre from the 12th December until the 10th February. Open 7 Days from 9.00am – 4.00pm. Check Facebook for Christmas Holiday opening hours or ring 8398 0009. 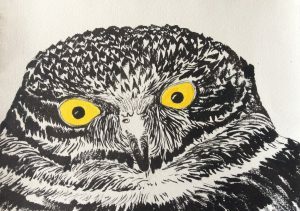 Silvio will exhibit a Galah and an Owl at this exhibition at the Lucy McEachern Gallery in Wingeel, NE of Geelong, Victoria,from the 17th -25th November. Silvio is taking part in this exhibition which runs from the 9th September till the 7th October. 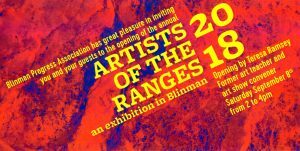 The group of exhibiting sculptors comprising Silvio, Quentin Gore, Jina Lee, Barry Lincoln, John Nelson and Ben Tolhurst is currently working at Wirrealpa Station, some 60km to the east of Blinman, until the end of September. No. 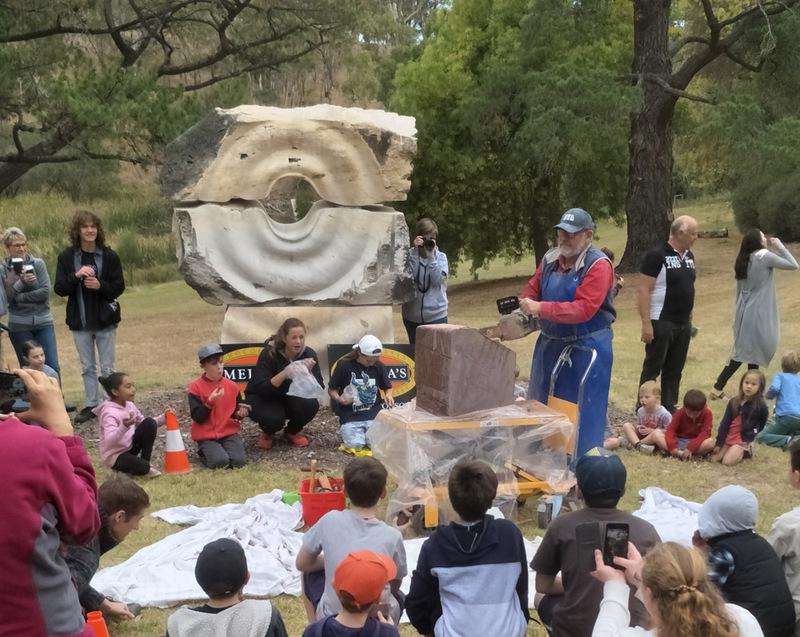 22, “The Sculptors”, was installed in the Newenham Estate at Mt Barker on the 9th August. South Australian Living Artists Festival will again take place in August. Silvio will hold Open Studio on the first weekend only, Saturday 4th and Sunday 5th from 10.00am till 4.30pm. Address: 157 Swamp Road, Balhannah SA 5242. 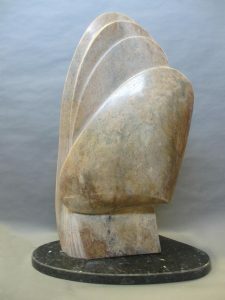 Also present to answer your questions will be sculptors John Nelson, Barry Lincoln and Peter Syndicas. Silvio hopes to do some lino-printing during the weekend. Silvio will also be showing during SALA at “Atelier”, 1 Cox Place, Crafers SA 5152 along with Rod Bax and at Mt Lofty House from the 5th – 12th August with Quentin Gore, Nicholas Uhlmann & Peter Syndicas. 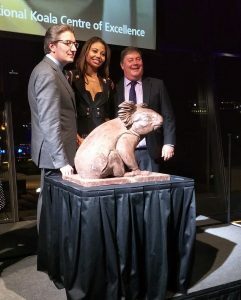 The launch at Adelaide Oval was attended by Ceawlin Thynn, Viscount Weymouth of Longleat, Wiltshire and Lady Emma, pictured with Professor Chris Daniels. Also present were the Governor Hieu Van Le & Mrs Le, Minister David Speirs and the Horwood family of Emmaline’s Country Kitchen. MC was David Bevan of Radio Adelaide 891. 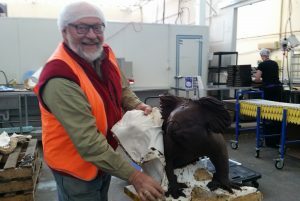 Working at Emmaline’s Country Kitchen at Lobethal, Silvio has made a chocolate koala which will feature at a fundraiser at The Adelaide Oval for the newly established International Koala Centre of Excellence. 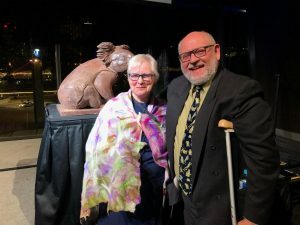 Chaired by Professor Chris Daniels, it hopes to establish a koala research centre at the Cleland Wildlife Park where Silvio’s bronze Koala, cast from the same mould, sits proudly at the entrance.